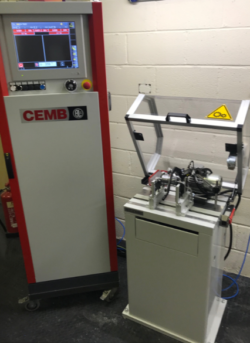 CEMB Hofmann dynamic balancing installation ZB5TCGV is a standard two plane horizontal balancing machine with a belt drive system. This machine plays an integral part of the production process for correcting unbalance in rotary engines. Fitted with piezo transducers for measuring unbalance, this hard bearing dynamic balancing machine replaces soft bearing solutions that are no longer supported by the manufacturer. An additional feature of this machine is the two options of having it either mounted on a rigid bench or with base and an extended cabinet for floor mounting. This state of the art machine benefits from a zero speed interlock safety guard and the latest software calculates the least number of holes required to achieve the tolerance given the maximum depth of hole, drill dimeter and density of material to be removed. In addition, there is an automatic calibration protocol for removing material by drilling holes in predetermined angular positions.